We are delighted to secure a new project with Peloton, the innovative fitness brand that is taking the UK by storm with their luxury indoor exercise bikes and immersive online cycling classes. This is the initial structural phase of their scheme in the heart of Covent Garden. The project is located in Floral Street in a building we remodelled for our long standing Client, Capco. Peloton are creating a flagship training studio where members can access live-streamed and pre-recorded classes and fitness enthusiasts can immerse themselves in the full Peloton cycling and retail experience. Eight members of the Knight Harwood team took part in an evening of volunteering at Glass Door Homeless Charity, a non-profit organisation which partners with churches to give shelter and support to homeless people. The evening consisted of preparing and serving food and refreshments, giving a hand in the kitchen and most importantly sitting down and chatting with the guests. A number of Knight Harwood staff are regulars at this shelter in Brook Green, West London. Justin Welby, the Archbishop of Canterbury, regularly visits our project at Lambeth Palace Library to review progress and support the whole team. He is particularly interested in the welfare of the operatives and site safety. A recent visit included a blessing from the Archbishop as the foundation stone was laid. Construction is underway for completion in Spring 2020. Knight Harwood have successfully handed over our first project of the year within a development close to Regents Park. This £15m, 40,000 sq ft mixed use scheme for Chait Investments involved the construction of a cool new office space and four luxury apartments. The project involved substantial structural reconfiguration to each building, new façades, restoration works, and a high quality fit out to both residential and commercial spaces. Our business has always revolved around successfully developing the skills of talented individuals. An important part of this process is introducing young people to our business from a variety of backgrounds. Last year’s recruits included apprentice level and post graduates with each completing a 12 month structured training programme. This involved them in engineering, surveying and construction management disciplines. 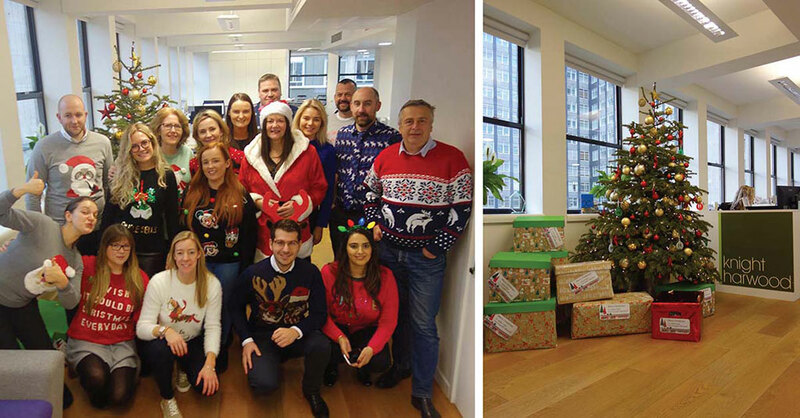 With the festive season now upon us, the Knight Harwood team threw themselves into our chosen charitable activities for Christmas 2018 last Friday. This included a company wide Christmas Jumper Day in aid of Children in Need and a collection of clothing and essential items for Glass Door homeless shelter. The combined total for both collections exceeded £10,000 which is an amazing effort by all involved for two worthy causes. Knight Harwood has been appointed as the Main Contractor for the refurbishment of the home of the British Academy of Film and Television Arts (BAFTA) in Piccadilly. This prestigious Grade II listed building will become a rejuvenated home for BAFTA, providing a modern cinema experience, new and improved gallery and event space and a new enlarged entrance and catering facility. The professional team includes Benedetti Architects, United Design Partnership, Price & Myers, Harley Haddow and Jackson Coles. The Queen opened the new Lexicon shopping centre in Bracknell last week where our Special Works business delivered a number of projects – The Queen is captured here meeting our team. They are in The Bull pub which is an old listed building which we converted into a modern restaurant. This was a very special and memorable day for Knight Harwood. Congratulations to the whole team at Special Works who delivered this very successful project. Another enjoyable team building event at the annual Knight Harwood golf day. This year’s event was played out at Moor Park golf course where 30 hardy golfers fought it out over 18 holes. Our project at Lambeth Palace Library is occurring within the grounds of the Archbishop of Canterbury’s residence in London, and it is no surprise that he is keenly watching progress on site, constructing the Church’s new archive and library. Our team recently supervised the Archbishop climbing the tower crane on site and the unveiling of a plaque to record a blessing for the site and safety of all involved. Client engagement in our projects is always positive and encouraged, particularly when a shared ethos for wellbeing and health & safety awareness is at the core of both parties involved. Knight Harwood are delighted with the completion of our mixed use scheme at Fetter Lane for Evans Randall. This £24 million, 104,000 ft2 project involved remodelling a tired 90’s office building, creating modern office facilities with retail space. It was designed by John Robertson Architects, Heyne Tillett Steel and MTT. Alinea Consulting are the PQS. This £17.5 million refit project has completely transformed a huge shopping mall into a new and exciting retail experience. Our team delivered the project within a live shopping centre working closely alongside retailers such as the Apple Store, John Lewis & Partners, Marks & Spencer and Topshop. The scheme completed this month and is now all open to the public. Our new sports building for King’s College School is nearing the end of a heavy structural phase of works. Our team are just completing the sports hall’s steel frame, gymnasium RC pavilion and the 25m swimming pool structure. The project is due to complete in the spring of 2019 and will be a state of the art sports facility for this prestigious school. The building has been designed by David Morley Architects, Price & Myers and Max Fordham. The Knight Harwood cricket team were delighted to win the Eclipse Lord’s Trophy following a tense day of knock-out cricket at Lord’s. The team were captained by Ex England fast bowler Chris Tremlett. We are delighted to announce that Knight Harwood has recently been commissioned as the Main Contractor for this 7,000 sq ft luxury fit out of a triplex penthouse overlooking the River Thames, from shell & core. The scheme comprises new M&E services throughout, mahogany veneered wall panelling, marble to the bathrooms, specialist joinery and timber decking to the roof terrace. The Knight Harwood team came together during June for our annual summer meeting and awards. As last year’s event was such a success we returned to the prestigious Institute for Engineering and Technology along the Embankment overlooking the River Thames. Staff were updated on Knight Harwood’s achievements in the past year and looked forward to our plans for the year ahead. As ever our ambition is still to be the best construction firm in London. This was followed by our company awards ceremony and afterwards staff enjoyed food and drinks whilst taking in the stunning views of the City from the riverside balconies. We were over the moon to discover that our project at Savile Row for Derwent London has won a RIBA (Royal Institute of British Architects) National Award 2018. The judges were hugely complimentary about both the finished product and the degree of collaboration that was evident on the scheme. This is a great accolade and we are incredibly proud of our team. Knight Harwood’s Gold Rush in the City! Congratulations to our Moorgate and Fetter Lane projects who each collected Gold Awards at the annual City of London Considerate Contractor Scheme awards at the Guildhall. This is a fantastic achievement for two challenging projects in the heart of the City. Our scheme at Fetter Lane also went on to win the coveted Chairman’s Trophy after being nominated alongside 80 other schemes in the City – Well done to both teams and a huge thank you to our supply chain. The Archbishop of Canterbury, Justin Welby, has broken the first ground and construction is now underway at the site of the new Lambeth Palace Library. This is one of the oldest public libraries in the UK and houses the most important ecclesiastical collection of rare books and manuscripts outside of the Vatican. The new building, in the grounds of Lambeth Palace, is expected to be completed and open to the public by the end of 2020. No, we are not employing 20 new chefs at Knight Harwood! April saw our Project Administrators team get together for their bi-annual forum, to share best practice and discuss new systems and procedures. It was followed by a fun evening of making super special pizzas, and here they are all ready to go! We were delighted to complete 2 stunning show apartments at the luxury Clarges development in Mayfair for British Land. Both designed by Martin Kemp Design. Interior features include fabric wall panelling, specialist joinery, feature lighting and carefully selected and book matched stone finishes. We have now completed 3 projects in Clarges with our 4th project due to handover in August 2018. Our Special Works division have secured a fantastic new scheme with AVIVA involving a high-quality refurbishment of the Vodafone store on Oxford Street. The retail space will be transformed into a new and modern facility. Works are due to commence on site in May. This is Knight Harwood’s 3rd project with Aviva. Stick ‘em up! Knight Harwood Bank Heist! Over 50 staff took part in a bank heist, stealing the crown jewels from vaults in the City. Each team had 60 minutes to solve the clues to steal the jewels and open the vault. The winning team managed to escape in a record time of 50 minutes and 30 seconds. What a night! We are delighted to announce that Knight Harwood has been commissioned as the Main Contractor for a major restoration/ new build scheme in Hampstead Heath, London. We are creating a beautiful new private residence across 34,000 sq ft. The works to Athlone House, a large Victorian home-built c.1872, will include the refurbishment and remodelling of the existing building and the creation of a modern extension to replace the walled garden and conservatory. The aim is to create a family residence that pays homage to the original designs with details such as Dutch gables, castellations on the tower and heraldic beasts. The building is set in a natural landscape over 7 acres by the Heath. The scheme is due to start on site in January with a completion date in early 2020. Our Christmas party…spot the party animals! The whole company, with partners, danced the night away until the early hours at the Park Plaza hotel in London with music by DJ Joe Callanan. With over 200 guests it was a fantastic night to remember and a great way to round off such a successful year for Knight Harwood. In his welcome speech, director Ian Harwood reminded staff of their achievements in 2017. The business has secured more work going forward than ever before which is a tribute to all the staff’s hard work and our Clients’ increasing support for the service we provide. Knight Harwood are fortunate enough to have negotiated 74% of their current portfolio. Ian also recognised another six staff who have been with the business for over 10 years with a special gift. Thank you again to all of them. We have been supporting Glass Door homeless charity for many years and several members of our staff regularly volunteer at the night shelter led by facility coordinator Fay Dunnery. Glass Door offers vital support to the homeless community. As part of our continued support for this local night shelter we arranged a collection of essential items for those in need over Christmas. This included hats, scarves, food and toiletries among other things. Becky Evans of Glass Door joined us to collect the gifts and meet our staff. We were also delighted to surprise Becky with an additional donation of £10,000! Our Directors Oliver and Ian pictured with Fay Dunnery presenting Becky Evans with a donation of £10,000 for Glass Door. Earlier this year Knight Harwood began a partnership with Goldfinger Factory providing them with much needed business support. Goldfinger is a social enterprise which means it is a business with a significant focus on helping others and charitable works in their local community. It reclaims, upcycles and transforms materials to create bespoke, exquisite furniture and interiors whilst also providing opportunities for the young and unemployed in one of London’s most deprived neighbourhoods, near to Grenfell Tower in West London. Knight Harwood’s initial focus has been on improving Health & Safety at the Factory including providing audits and bespoke site signage. We have also arranged for their staff to receive First Aid training. We are delighted to announce that our team at Floral Street achieved handover one week ahead of schedule! The project involved significant structural remodelling, dividing the space into two retail units and office space over 4 floors right in the heart of Covent Garden. David Beckham’s store Kent & Curwen occupied one of the retail units and is now open for business. Our Autumn get together took place at Bounce in Farringdon – the home of Ping Pong! Over 50 staff enjoyed food, drinks and table tennis in our exclusive luxury games room. Bounce Games Gurus provided the entertainment and hosted the tournament. The competition was intense and ping pong balls were flying everywhere! As expected it was the grand final that was the most exciting match of the evening. Chris Roe and Tim Schumann faced off Tim Burnage and Conor Hills. Both teams were perfectly in sync and played an awesome three-set match which garnered plenty of “oohs” and “aahs” from the crowd. It was a very close final however ultimately Tim Burnage’s super serves proved unstoppable and Tim and Conor became the almighty ping pong champions. Royal Parks Half Marathon – our 4th year on the trot! Congratulations to our team who took part in the Royal Parks Half Marathon on Sunday 8th October. The 13.1 mile route takes in some of the capital’s world-famous landmarks and four of London’s eight Royal Parks – Hyde Park, Green Park, St James’s Park and Kensington Gardens. Our team ran in aid of World Child Cancer and raised over £2,000 for this special charity. This year Knight Harwood also sponsored the vests worn by all World Child Cancer runners. Well done to all our runners for crossing the finishing line! It is a fantastic achievement. Bracknell Town is open for business! Knight Harwood’s Special Works team were delighted to take part in the massive redevelopment of Bracknell Town Centre led by the local council and Bracknell Regeneration Partnership, a joint venture between Legal & General and Schroders. It opened to the public this month with spectacular new retail spaces, restaurants, bars and a 12-screen cinema. This is all a part of the Lexicon retail centre. Our Special Works team were involved in a whole range of different projects including the refurbishment of the Bull public house, parts of which date back to the 14th century, a fantastic focal point in the town. We also took over the management of the logistics of the entire regeneration scheme managing the security, traffic, waste removal and site inductions for over 1000 operatives working there. Birdies and eagles but more bogies! Knight Harwood’s annual golf day was held this year at the London Club in Sevenoaks. 34 of the finest golfers played the championship course in the hope of lifting the coveted Knight Harwood Golf Trophy. The sun was shining and there was not a cloud in the sky as they made their way around the challenging course. Martin Cooke finished in pole position and was declared the KH Golf Champion of 2017! This month we welcomed five new graduate trainees to Knight Harwood. Conor, Kyle, Tim, Joe and Alex will undertake a year long multi-disciplinary training programme tailored to the career path they wish to follow. This will provide them with the experience and skills they need to become successful Construction Managers, Quantity Surveyors and Building Services Engineers. As part of our ambition to be the best construction firm in London, we actively look for the those that really enjoy creating something and are looking forward to being a part of our fantastic industry. This year’s graduates have come from as far North as Nottingham Trent University and as far south as the University of Cape Town! The Grosvenor Estate are a global player in the property market and they own assets in over 60 countries around the world. Founded in 1677, it represents all the business activities of the Grosvenor family, headed by the Duke of Westminster. They have an extremely impressive central London portfolio in and around the West End, Belgravia and Mayfair. We are proud to announce that Knight Harwood have been invited to join the Grosvenor framework with the opportunity to be involved in constructing their future projects. This marks another special milestone in Knight Harwood’s journey and our ambition to be the best construction firm in London. It is no coincidence that many of Grosvenor’s values and objectives align with our own in terms of wanting to work collaboratively, taking care of the environment along with a desire to deliver fantastic projects and taking real pride in what we do. Football legend David Beckham recently visited our project in Covent Garden. He was there to see the progress on his new store in Floral Street. David is an investor in the brand Kent & Curwen which moves in as the retail tenant this Autumn. Our staff were delighted to show Becks around the project. Upon leaving the site David was mobbed by fans and shoppers as he made his way back to his waiting car. Our team said he was a real gentleman. Mid July saw the whole company come together for our annual summer meeting. This year the event was held in the prestigious Institute for Engineering and Technology in Savoy Place, overlooking the River Thames. Staff were updated on Knight Harwood’s achievements in the past year and looked forward to the plans for the year ahead that will set Knight Harwood apart as the best construction firm in London. This was followed by our company awards ceremony. Afterwards staff enjoyed food and drinks whilst taking in the stunning views of the City from the riverside balconies. Knight Harwood recently took part in a City Centre Youth Programme along with architects AHMM and engineers Arup. The programme brought together young people to create a temporary installation for Paternoster Square, in the heart of the City. Over the course of five workshops covering design, engineering, construction and planning, a group of fifteen young people aged 14-19 were given the opportunity to create a sculpture installation using a modular assembly system called Miniplex. The team eventually put the whole structure together in Paternoster Square. The final installation made a striking visual impact within the square set against the majestic backdrop of St Paul’s Cathedral. We were thrilled to handover our project at Great Portland Street in May. This complex mixed-use scheme involved major rebuilding and refurbishment of a terrace of neighbouring properties of differing ages and styles including a Grade II listed building. The scheme provides retail, office and residential spaces in the West End of London. This is Knight Harwood’s 8th project for the Client Great Portland Estates. We are delighted to have won another fantastic project with Native Land, this time within the Holland Park Villas development in Kensington. The works comprise the high specification fit out of a four-bedroom luxury penthouse to create a spectacular show apartment. Knight Harwood are working closely with architects MSMR to develop the design. For our spring staff get-together over 60 staff paid a visit to Swingers crazy golf club, located just a stone’s throw away from the Gherkin in the City. Food and drinks were enjoyed by all in the Upper Clubhouse before teams of four made their way around the bespoke 9-hole Windmill golf course. It really was great fun! The Media Centre is an iconic building in the world of cricket and this is the 4th project we have completed for Lord’s. Our team transformed the Media Centre into a state of the art facility, with the latest technology for radio and television. The refit has provided an increased area for 144 journalists to broadcast from on match days and photographers will benefit from an extended external gantry. The project was timed to finish in time for the 2017 season. Knight Harwood have completed the Lanesborough Club & Spa which is part of the prestigious Lanesborough Hotel in Belgravia. It is complete with hydro pool, thermal suites, steam rooms, treatments rooms, bars and restaurants. It offers guests and private members access to one of the most impressive spa facilities and fitness suites within central London, spread over 21,000 sq ft.
Knight Harwood have been commissioned to build the new public library and archive for the Church of England at Lambeth Palace – home to the second largest religious collection in Europe after the Vatican. We overcame strong competition to win this fantastic project, designed by Wright & Wright Architects and Price & Myers. It really is an honour to be involved in a project of such historic significance and cultural ambition. The site is within the Palace grounds so the collections can continue to be appreciated in the setting in which they were bequeathed to the public by Archbishop Bancroft in 1610. Knight Harwood’s 8th project for Capco in Covent Garden! We are delighted to announce we have successfully completed our project at 26-27 Southampton Street in Covent Garden, a development of ten apartments in a listed building. This is the 8th project that Knight Harwood have undertaken working with Capco to realise their vision to create a new brand in residential accommodation, Covent Garden Living. Knight Harwood are pleased to announce the appointment of a new director to the board, Oliver Driscoll. Our business has continued to grow steadily whilst we work extremely hard to maintain our hallmark of delivering an excellent product for our Clients. With this growth and our focus on quality comes the need to strengthen the board of directors. Oliver has been with us for nearly ten years and has overseen the success of many of our key projects; moving forward he will be the director responsible for specific projects and Client accounts. This comes at a perfect time for Knight Harwood as we are in the midst of some fantastic projects with other exciting schemes due to start soon. Knight Harwood 2016 Christmas Party…great fun and a fine end to the year! In December we held our annual Christmas party at The Lancaster Hotel, Hyde Park, attended by staff and their partners. The theme this year was ‘après ski’. During the champagne reception guests enjoyed canapés from the Alpine food stations and our braver guests also sampled the vodka luge! Almost 200 guests joined in the celebrations and here are some photos in the snowy hills to prove it! Knight Harwood were delighted to successfully handover our £33m luxury residential project at 88 St James’s Street. The project, designed by EPR Architects, included the refurbishment and complete rebuilding of a Grade II listed building, originally built in 1905, returning it back to its original grandeur to provide eight large apartments. The elegant residences, next to St James’s Palace, boast spacious classical interiors throughout. The use of exquisite marble, quartz enriched plasterwork and fine joinery complement the restored features. It looks spectacular! We are pleased to handover our 70,000 sq ft office project in Soho Square, Knight Harwood’s second project for Aviva. The project was designed by Buckley Gray Yeoman architects and involved complex structural re-configuration of core areas, relocating plant equipment to the roof and creating large open plan office floor plates and a roof terrace with views looking out over London. This extensive office redevelopment in the heart of London’s West End, was delivered as a shell & core development to allow the incoming tenant to complete the fit out works to their own requirements. In November we successfully completed our second project for the Royal Academy of Engineering, called The Taylor Centre. This Enterprise Hub is our second scheme for the Royal Academy of Engineering in Carlton House Terrace, a Grade I listed building and it will provide modern facilities for Academy Fellows to support promising engineering entrepreneurs, through mentoring, training and funding to accelerate technological enterprise. The project was designed by Wright & Wright Architects and Arup, with Stuart Johnson acting as Project Manager and Faithful & Gould as PQS. We are delighted to announce our appointment to construct the new sports building for King’s College School in Wimbledon. King’s was founded in 1829 and is the top independent school in London, if not the world. This is a really exciting scheme designed by David Morley Architects, Max Fordham and Price & Myers. It includes a new 25 metre swimming pool, a 6-court sports hall and squash courts. The new facilities form a set of three linked pavilions with the sports hall and the swimming pool located either side of a central pavilion. The central pavilion is two storeys high and contains the sports centre reception and changing rooms at ground level with viewing galleries, a strength and conditioning suite, exercise area and aerobics studio above. Full House at our Casino night out! Over 60 staff attended our exciting Las Vegas Casino Night held at the Sky Bar in the City. Professional croupiers ensured staff enjoyed games of Black Jack, Roulette and the Wheel of Fortune and at the end of the evening everyone’s chips were counted. Lady Luck was certainly there for Harry, who took home the grand prize of a meal for two in The Shard. Nick and Darren were our runners up, each winning a bottle of champagne. Congratulations to Lewis who became the 2016 Knight Harwood golf champion at the London Golf Club. This was the 10th anniversary of our Knight Harwood golf competition. There were 35 players who enjoyed a great day together on one of the UK’s top golf courses. Andy (at the right hand end of the picture) won the golf pullover of the day competition!! Knight Harwood are soon to be appointed to deliver a project for Intu that will transform the infrastructure of the Intu Watford Shopping Centre. The refurbishment works will include the replacement and upgrade of the electronic systems and associated infrastructure, followed by architectural finishes throughout the entire shopping mall. The challenge is to complete these works whilst all the retail units are fully operational. Knight Harwood have delivered a number of projects at Lord’s Cricket Ground. In August a team from Knight Harwood took part in a cricket world cup tournament, played at Lord’s Nursery Ground. Four teams played in the tournament and each team was headed up by a world class cricket legend. Devon Malcolm, one of England’s fastest bowlers, was the Knight Harwood Team captain and helped them secure second place. Howzat? At the end of June the whole company got together for Knight Harwood’s annual Summer Meeting. The afternoon began with the traditional company photograph taken on the steps by The Mall. This was followed with a presentation by directors and senior staff, finishing off with the Annual Staff Awards for outstanding performance, including our new M&E Revolution awards! The awards recognises and celebrates outstanding efforts of staff members throughout the year. In June Rianna joined us for a four week work placement, gaining experience in the office with accounts and the proposals departments and on site, learning about safety and construction management. In July we hosted two sixth form students from Dunraven School in Streatham, London. Komal and Mariana joined projects in Covent Garden, Knightsbridge and Mayfair where they had an opportunity to understand the role of the various disciplines on site, including quantity surveying and environmental engineering. The Knight Waveriders crew took part in the Construction Industry’s Dragon Boat Challenge in June with Director Chris Roe heading up the powerful squad. Unfortunately we didn’t win the challenge but what we lacked in skill we most certainly made up for with team spirit! Thanks to the support and generosity of our sponsors the Knight Waveriders team raised over £2,000 for CRASH, helping this construction based charity continue their work creating places that care for vulnerable people in homelessness projects and hospices. At the end of May we successfully completed our first project for Aviva Life and Pensions UK Limited. The project in Great Newport Street comprised the complete conversion of the building from commercial to residential use and involved significant demolition and structural alterations. The end result was 14 luxury apartments over 5 floors plus retail space. The front façade includes a bespoke rainscreen and brise soleil design which uniquely identifies the building from neighbouring properties. We are delighted to announce that Knight Harwood have obtained certification for Environmental and Health & Safety Management, ISO 14001 and OHSAS 18001 respectively. The audit process has been assessed by the British Standards Institution. Our winners attended the Considerate Constructors Scheme’s National Site Awards at The Mermaid, Blackfriars. The awards recognise the outstanding dedication of registered sites towards improving the image of the construction industry by demonstrating the highest levels of consideration towards the public, its workforce and the environment. This is an exceptional achievement for our project teams. It’s game, set and match at the Queen’s Club! The Queen’s Club is a private members club and one of the UK’s leading sporting destinations. Our first project here completed at the end of March. It comprised the redevelopment of the Pavilion Building and all of its hospitality spaces, internally and externally – all in time for the start of the AEGON Championships. Knight Harwood are about to start their second project for Queen’s, part of the North Stand redevelopment. Lord’s Media Centre – check out our new photos! The Media Centre at Lord’s is an iconic building in world cricket. As part of our 4th project at Lord’s, the latest technology for radio and television was installed to provide a state of the art facility. The refit also provided improved space for 144 journalists to broadcast on match days and photographers will benefit from an extended external gantry. The work is being carried out in phases split over two winters to allow the venue to be used during the summer months. Phase 1 is complete and Phase 2 will commence mid-September. The Special Works team were involved at the same time, undertaking a tricky project to remove old syphonic drainage systems and replace them with a new gravity system. Knight Harwood have successfully handed over our project in Paul Street for Stanhope Plc. This commercial scheme comprised major structural modifications to an existing six storey office building to reconfigure the space into a more efficient layout, including adding a new floor to the top of the building. The works included a full Cat A fit out with an intelligent building controls system for lighting and HVAC systems. The design has a warehouse feel with much of the building’s fabric being retained and left exposed including concrete soffits and areas of brickwork. The windows were replaced with more modern Crittall style metal windows to further emphasise the warehouse feel. On 10th March almost 60 Knight Harwood staff took part in a company trivia night at The Bloomsbury Hotel in Central London. It was great to see everyone enjoying a few laughs and drinks together. In 1st place and our big winners were the Jedi Knights! Just over £800 was raised on the night for our two chosen charities, CRASH and Cancer Research UK. The winning team the Jedi Knights! Knight Harwood are delighted to have been appointed by Derwent London to undertake a major refurbishment scheme in Savile Row. The project comprises a 60,000 sq ft office within an eight storey building. It will become Derwent’s new and very unique headquarters. The design includes a cool, contemporary feel internally along with various external modifications to create new terraces. Knight Harwood are delighted to be involved in another fantastic project with Capco to carry out the redevelopment of Carriage Hall. It is part of the ongoing regeneration works in Covent Garden which we are already a big part of. The scheme will create new first class retail space within a Grade II listed building in Floral Street, just nearby The Piazza. We are delighted to have secured a major design and build project for The Girdlers’ Company in Farringdon. The £15 million mixed use scheme comprises 45,000 ft2 retail units, commercial office space and five private residential apartments. The building is designed by Stirling Prize winning architects, Allford Hall Monaghan Morris. In the lead up to Christmas, we held our usual annual party for staff and partners which was great fun and attended by over 180 guests, at The Lancaster Hotel by Hyde Park. During the champagne reception circus performers, led by the ringmaster, amazed guests with their juggling and acrobatic skills. The night ended with everyone on the dancefloor followed by some sore heads at breakfast the next day! We are pleased to hand over our third project for Derwent London. This project involved the construction of a modern seven storey mixed use development providing nine high specification residential apartments, two affordable units and retail space in a busy part of Fitzrovia. The newly built scheme has been named The Corner House. This was our first project working with architectural firm DSDHA. We are absolutely delighted to complete the fabulous new sports building at Godolphin & Latymer private girls’ school in Hammersmith. The project involved the construction of a new two storey sports hall with a single storey building adjoining, housing changing rooms, fitness suites, dance studios, offices, storage and other ancillary accommodation. The pupils were thrilled with their new state of the art sports facilities. This is our first project with Walters & Cohen Architects. Organised by our H&S Manager, 12 Knight Harwood employees took part in the Royal Parks half marathon in October, kicking off in Hyde Park. A group of four friends and family members also signed up to run as part of the Knight Harwood team. The team were delighted to be taking part in this great event for World Child Cancer, an inspirational charity that provides treatment for children with cancer not fortunate enough to live in the developed world. Everyone running in our team crossed the finish line and we raised almost £10,000. On Thursday 17th September over 600 guests from across the industry joined the staff of Knight Harwood for their 10th birthday party. The stunning venue in Mayfair was packed with friends, colleagues and staff. A short speech from John Knight MD, spoke about Knight Harwood’s continuing ambition to maybe not be the biggest but ‘The best construction firm in London’. He thanked staff, Clients, consultants and suppliers for their support and helping to make Knight Harwood the established firm that it is today. We’re 10 years old this year! John Knight, MD of Knight Harwood talks about how Knight Harwood started…’It seems like only yesterday that Ian Harwood and I were holding our first meetings and camping out in Starbucks in Notting Hill, our first Knight Harwood office. Maybe we were one of the early ‘coffee shop culture start ups’ that are talked about these days! 10 years ago, we left ISG, a firm I had spent fourteen years with and Ian was there for twelve years. The first major challenge we faced when starting the business was to raise the finance and then we leapt over the precipice! Our first year’s £1m turnover target was undoubtedly conservative, however we went on to turn over £8m and then more than doubled turnover in the second year; we have continued to grow ever since. We had very strong support from our clients and friends in the industry, including the supply chain, which made a huge difference. In this early period we built an enviable leadership team with Richard Harvell, Chris Roe and Tim Whittaker joining as board directors. They brought a wealth of experience to the business in three different areas of expertise, which is one of the strengths of Knight Harwood. Many more key senior staff joined around the same time, all of whom are still with us today. Together we set out an agenda of being the best construction firm in London and we have stuck to that mantra and attitude ever since, despite facing a serious recession after only two years in business. Our first office was in The Tea Building in Shoreditch which was a fantastic base to start from and we have good memories of those early days. When we outgrew this space, we moved closer to our clients and projects in the West End in 2012. We may be looking for a larger office again pretty soon to house our growing team! We are looking forward to celebrating our birthday on 17th September at a fantastic party. We have all come a very long way in an incredibly short space of time and built a fantastic client portfolio that most firms haven’t assembled in 30 years! I am incredibly proud of our reputation and what we have achieved including some really special projects. The recent creation of our Special Works business couldn’t have happened at a better time either, and right now there is no stopping their progress! All of this success is down to Knight Harwood employing the best people who understand our culture and how to deliver a first class product every time, and treat others with respect. Over a weekend in August an intrepid team of 8, plus a support team of 4, embarked on the challenge to trek nonstop for 100km across the Yorkshire Dales within 30 hours. The gruelling event was hampered by a massive lightning storm which resulted in everyone being taken off the course for three hours to shelter in a barn! The teams were then evacuated off the hills through treacherous flash floods, down steep hillsides to continue to the 65km silver finish line. Five team members pushed on even further and were thrilled to achieve the gold award of completing the whole 100km. This was a fantastic achievement considering the conditions and the terrain. The Knight Harwood team raised an amazing £7,235 for Oxfam. We are delighted to have secured another major project for Great Portland Estates. This £19 million mixed use scheme consists of contemporary office space and a residential element split into affordable and market class apartments. Managing Director John Knight said “I am very pleased to have secured this project with a very important existing client of ours. It is in a great ‘north of Oxford St’ location and with a design team we know well including architects Lifschutz Davidson Sandilands. It is a project where we can demonstrate our full range of skills with new build, refurbishment and fit out”. Earlier this year Knight Harwood sponsored a 1,452km journey from London to Cannes, with people in property and construction taking part. To date, with Knight Harwood’s support a staggering £264,000 was raised. All the cyclists donned the Knight Harwood branded livery! Over 100 cyclists took part.